For other uses, see Reconquista (disambiguation). The Reconquista[a] (Spanish and Portuguese for "reconquest") is a name used in English to describe the period in the history of the Iberian Peninsula of about 780 years between the Umayyad conquest of Hispania in 711 and the fall of the Nasrid kingdom of Granada to the expanding Christian kingdoms in 1492. The completed conquest of Granada was the context of the Spanish voyages of discovery and conquest (Columbus got royal support in Granada in 1492, months after its conquest), and the Americas—the "New World"—ushered in the era of the Spanish and Portuguese colonial empires. Traditional historiography has marked the beginning of the Reconquista with the Battle of Covadonga (718 or 722), the first known victory in Iberia by Christian military forces since the 711 military invasion of Iberia by combined Arab-Berber forces. In that small battle, a group led by the nobleman Pelagius defeated a Muslim patrol in the mountains of northern Iberia and established the independent Christian Kingdom of Asturias. In the late 10th century, the Umayyad vizier Almanzor waged military campaigns for 30 years to subjugate the northern Christian kingdoms. His armies, mostly composed of Slavic and African Mamluks (slave soldiers), ravaged the north, even sacking the great shrine of Santiago de Compostela. When the government of Córdoba disintegrated in the early 11th century, a series of petty successor states known as taifas emerged. The northern kingdoms took advantage of this situation and struck deep into Al-Andalus; they fostered civil war, intimidated the weakened taifas, and made them pay large tributes (parias) for protection. After a Muslim resurgence in the 12th century the great Moorish strongholds in the south fell to Christian forces in the 13th century—Córdoba in 1236 and Seville in 1248—leaving only the Muslim enclave of Granada as a tributary state in the south. After 1491, the entire peninsula was controlled by Christian rulers. The conquest was followed by the Alhambra Decree (1492) which expelled Jews who would not convert to Christianity from Castile and Aragon, and a series of edicts (1499–1526) which forced the conversions of the Muslims in Spain, although later a significant part of them was expelled from the Iberian Peninsula. The concept of Reconquista, consolidated in Spanish historiography in the second half of the 19th century, was associated with the development of a Spanish national identity, emphasizing nationalistic and romantic, and occasionally, colonialist, aspects. Since the 19th century traditional historiography has stressed the existence of the Reconquista, a continuous phenomenon by which the Christian Iberian kingdoms opposed and conquered the Muslim kingdoms, understood as a common enemy who had militarily seized territory from native Iberian Christians. The concept of a Christian reconquest of the peninsula first emerged, in tenuous form, at the end of the 9th century. A landmark was set by the Christian Chronica Prophetica (883–884), a document stressing the Christian and Muslim cultural and religious divide in Iberia and the necessity to drive the Muslims out. The Islamic Almohad dynasty and surrounding states, including the Christian Kingdoms of Portugal, León, Castile, Navarre, and the Crown of Aragon, c. 1200. Both Christian and Muslim rulers fought amongst themselves. Alliances between Muslims and Christians were not uncommon. Blurring distinctions even further were the mercenaries from both sides who simply fought for whoever paid the most. The period is seen today to have had long episodes of relative religious tolerance. The Crusades, which started late in the 11th century, bred the religious ideology of a Christian reconquest, confronted at that time with a similarly staunch Muslim Jihad ideology in Al-Andalus by the Almoravids, and to an even greater degree by the Almohads. In fact, previous documents from the 10th and 11th centuries are mute on any idea of "reconquest". Propaganda accounts of Muslim-Christian hostility came into being to support that idea, most notably the Chanson de Roland, a fictitious 11th-century French version of the Battle of Roncevaux Pass (778) dealing with the Iberian Saracens (Moors), and taught as historical fact in the French educational system since 1880. The modern idea of Reconquista is inextricably linked to the foundational myths of Spanish nationalism in the 19th century, and consolidated by the mid-20th century during Franco's National-Catholic dictatorship, based on a strong underlying Castilian ideological element. The idea of a "liberation war" of reconquest against the Muslims, depicted as foreigners, suited well the anti-Republican rebels during the Spanish Civil War who agitated for the banner of a Spanish fatherland threatened by regional nationalisms and communism. Their rebellious pursuit was thus a crusade for the restoration of the Church's unity, where Franco stood for both Pelagius of Asturias and El Cid. The Reconquista has become a rallying call for right and far-right parties in Spain to expel from office incumbent progressive or peripheral nationalist options, as well as their values, in different political contexts as of 2018. Some contemporary authors consider it proved that the process of Christian state-building in Iberia was indeed often defined by the reclamation of lands that had been lost to the Moors in generations past. In this way, state-building might be characterised—at least in ideological, if not practical, terms—as a process by which Iberian states were being 'rebuilt'.. In turn, other recent historians dispute the whole concept of Reconquista as a concept created a posteriori in the service of later political goals. A few historians point out that Spain and Portugal did not previously exist as nations, and therefore the heirs of the Christian Visigothic Kingdom were not technically reconquering them, as the name suggests. One of the first Spanish intellectuals to question the idea of a "reconquest" that lasted for eight centuries was José Ortega y Gasset, writing in the first half of the 20th century. However, the term is still widely in use. In 711, North African Berber soldiers with some Arabs commanded by Tariq ibn Ziyad crossed the Strait of Gibraltar, engaging a Visigothic force led by King Roderic at the Battle of Guadalete in a moment of serious in-fight and division across the Visigothic Kingdom of Hispania. After Roderic's defeat, the Umayyad governor of Ifrikiya Musa ibn-Nusayr joined Tariq, directing a campaign against different towns and strongholds in Iberia. Some, like Merida, Cordova, or Zaragoza in 712, probably Toledo, were taken by storm or after resistance, but many agreed to a treaty in exchange for maintaining autonomy, in Theodemir's dominion (region of Tudmir), or Pamplona, for example. The invading Islamic armies did not exceed 60,000 men. After the establishment of a local Emirate, Caliph Al-Walid I, ruler of the Umayyad caliphate, removed many of the successful Muslim commanders. Tariq ibn Ziyad was recalled to Damascus and replaced with Musa ibn-Nusayr, who had been his former superior. Musa's son, Abd al-Aziz ibn Musa, apparently married Egilona, Roderic's widow, and established his regional government in Seville. He was suspected of being under the influence of his wife and was accused of wanting to convert to Christianity and of planning a secessionist rebellion. Apparently a concerned Al-Walid I ordered Abd al-Aziz's assassination. Caliph Al-Walid I died in 715 and was succeeded by his brother Sulayman ibn Abd al-Malik. Sulayman seems to have punished the surviving Musa ibn-Nusayr, who very soon died during a pilgrimage in 716. In the end, Abd al-Aziz ibn Musa's cousin, Ayyub ibn Habib al-Lakhmi became the wali (governor) of Al-Andalus. The conquering generals were necessarily acting independently, due to the methods of communication available. Successful generals in the field and in a distant province would gain the personal loyalty of their officers and warriors and their ambitions were likely watched by certain circles of the distant government with a degree of concern and suspicion. Old rivalries and perhaps even full-fledged conspiracies between generals may have had influence over this development. In the end, the formerly successful generals were replaced by a younger generation considered more loyal to the government in Damascus. A serious weakness amongst the Muslim conquerors was the ethnic tension between Berbers and Arabs. The Berbers were indigenous inhabitants of North Africa who had only recently converted to Islam; they provided most of the soldiery of the invading Islamic armies but sensed Arab discrimination against them. This latent internal conflict jeopardized Umayyad unity. The Ummyyad forces arrived and crossed the Pyrenees by 719. The last Visigothic king Ardo resisted them in Septimania, where he fended off the Berber-Arab armies until 720. After the Islamic Moorish conquest of most of the Iberian Peninsula in 711–718 and the establishment of the emirate of Al-Andalus, an Umayyad expedition suffered a major defeat at the Battle of Toulouse and was halted for a while on its way north. Odo of Aquitaine had married his daughter to Uthman ibn Naissa, a rebel Berber and lord of Cerdanya (and, perhaps, contemporary Catalonia), in an attempt to secure his southern borders in order to fend off Charles Martel's attacks on the north. However, a major punitive expedition led by Abdul Rahman Al Ghafiqi, the latest emir of Al-Andalus, defeated and killed Uthman, and the Muslim governor mustered an expedition north across the western Pyrenees, looted areas up to Bordeaux, and defeated Odo in the Battle of the River Garonne in 732. A desperate Odo turned to his archrival Charles Martel for help, who led the Frankish and remaining Aquitanian armies against the Umayyad armies and defeated them at the Battle of Tours in 732, killing Abdul Rahman Al Ghafiqi. While Moorish rule began to recede, it would remain in parts of the Iberian peninsula for another 760 years. A drastic increase of taxes by the emir Anbasa ibn Suhaym Al-Kalbi provoked several rebellions in Al-Andalus, which a series of succeeding weak emirs were unable to suppress. Around 722, a Muslim military expedition was sent into the north in late summer to suppress a rebellion led by Pelagius of Asturias (Pelayo in Spanish, Pelayu in Asturian). Traditional historiography has hailed Pelagius' victory at Covadonga as the beginning of the Reconquista. No Muslim source mentions the battle at Covadonga, in contrast with the Battle of Toulouse in 721, with a death toll of perhaps tens of thousands, which was mourned for centuries as a large scale tragedy by the Iberian Muslims. For Pelagius, however, the Christian victory secured his independent rule, while the precise date and circumstances of the battle are unclear. Among the possibilities is that Pelagius' rebellion was successful because the greater part of the Muslim forces were focusing in Septimania and Toulouse (721). Two northern realms, the Basque Navarre and Asturias, despite their small size, demonstrated an ability to maintain their independence. Because the Umayyad rulers based in Córdoba were unable to extend their power over the Pyrenees, they decided to consolidate their power within the Iberian peninsula. Arab-Berber forces made periodic incursions deep into Asturias, but this area was a cul-de-sac on the fringes of the Islamic world fraught with inconveniences during campaigns and little interest. It comes then as no surprise that, besides focusing on raiding the Arab-Berber strongholds of the Meseta, Alphonse I centred on expanding his domains at the expense of the neighbouring Galicians and Basques at either side of his realm just as much. During the first decades, Asturian control over part of the kingdom was weak, and for this reason it had to be continually strengthened through matrimonial alliances and war with other peoples from the north of the Iberian Peninsula. After Pelayo's death in 737, his son Favila of Asturias was elected king. Favila, according to the chronicles, was killed by a bear during a trial of courage. Pelayo's dynasty in Asturias survived and gradually expanded the kingdom's boundaries until all of northwest Iberia was included by roughly 775. However, credit is due not to him but to his successors, the Banu Alfons from the Arab chronicles. Further expansion of the northwestern kingdom towards the south occurred during the reign of Alfonso II (from 791–842). A king's expedition arrived in and pillaged Lisbon in 798, probably concerted with the Carolingians. The Asturian kingdom became firmly established with the recognition of Alfonso II as king of Asturias by Charlemagne and the Pope. During his reign, the bones of St. James the Great were declared to have been found in Galicia, at Santiago de Compostela. Pilgrims from all over Europe opened a channel of communication between the isolated Asturias and the Carolingian lands and beyond, centuries later. After the Umayyad conquest of the Iberian heartland of the Visigothic kingdom, the Muslims crossed the Pyrenees and gradually took control of Septimania, starting in 719 with the conquest of Narbonne through 725 when Carcassone and Nîmes were secured. From the stronghold of Narbonne, they tried to conquer Aquitaine but suffered a major defeat at the Battle of Toulouse (721). Ten years after halting their advance north, Odo of Aquitaine married his daughter to Uthman ibn Naissa, a rebel Berber and lord of Cerdanya (perhaps all of contemporary Catalonia as well), in an attempt to secure his southern borders to fend off Charles Martel's attacks on the north. However, a major punitive expedition led by Abdul Rahman Al Ghafiqi, the latest emir of Al-Andalus, defeated and killed Uthman. After expelling the Muslims from Narbonne in 759 and driving their forces back over the Pyrenees, the Carolingian king Pepin the Short conquered Aquitaine in a ruthless eight-year war. Charlemagne followed his father by subduing Aquitaine by creating counties, taking the Church as his ally and appointing counts of Frankish or Burgundian stock, like his loyal William of Gellone, making Toulouse his base for expeditions against Al-Andalus. Charlemagne decided to organize a regional subkingdom in order to keep the Aquitanians in check and to secure the southern border of the Carolingian Empire against Muslim incursions. In 781, his three-year-old son Louis was crowned king of Aquitaine, under the supervision of Charlemagne's trustee William of Gellone, and was nominally in charge of the incipient Spanish March. Meanwhile, the takeover of the southern fringes of Al-Andalus by Abd ar-Rahman I in 756 was opposed by Yusuf ibn Abd al-Rahman, autonomous governor (wāli) or king (malik) of al-Andalus. Abd ar-Rahman I expelled Yusuf from Cordova, but it took still decades for him to expand to the north-western Andalusian districts. He was also opposed externally by the Abbasids of Baghdad who failed in their attempts to overthrow him. In 778, Abd al-Rahman closed in on the Ebro valley. Regional lords saw the Umayyad emir at the gates and decided to enlist the nearby Christian Franks. According to Ali ibn al-Athir, a Kurdish historian of the 12th century, Charlemagne received the envoys of Sulayman al-Arabi, Husayn, and Abu Taur at the Diet of Paderborn in 777. These rulers of Zaragoza, Girona, Barcelona, and Huesca were enemies of Abd ar-Rahman I, and in return for Frankish military aid against him offered their homage and allegiance. Charlemagne, seeing an opportunity, agreed upon an expedition and crossed the Pyrenees in 778. Near the city of Zaragoza Charlemagne received the homage of Sulayman al-Arabi. However the city, under the leadership of Husayn, closed its gates and refused to submit. Unable to conquer the city by force, Charlemagne decided to retreat. On the way home the rearguard of the army was ambushed and destroyed by Basque forces at the Battle of Roncevaux Pass. The Song of Roland, a highly romanticized account of this battle, would later become one of the most famous chansons de geste of the Middle Ages. Around 788 Abd ar-Rahman I died and was succeeded by Hisham I. In 792 Hisham proclaimed a jihad, advancing in 793 against the Kingdom of Asturias and Carolingian Septimania (Gothia). They defeated William of Gellone, Count of Toulouse, in battle, but William led an expedition the following year across the eastern Pyrenees. Barcelona, a major city, became a potential target for the Franks in 797, as its governor Zeid rebelled against the Umayyad emir of Córdoba. An army of the emir managed to recapture it in 799, but Louis, at the head of an army, crossed the Pyrenees and besieged the city for two years until it finally capitulated in 801. The main passes in the Pyrenees were Roncesvalles, Somport and La Jonquera. Charlemagne established across them the vassal regions of Pamplona, Aragon, and Catalonia respectively. Catalonia was itself formed from a number of small counties, including Pallars, Girona, and Urgell; it was called the Marca Hispanica by the late 8th century. They protected the eastern Pyrenees passes and shores and were under the direct control of the Frankish kings. Pamplona's first king was Iñigo Arista, who allied with his Muslim kinsmen the Banu Qasi and rebelled against Frankish overlordship and overcame a Carolingian expedition in 824 that led to the setup of the Kingdom of Pamplona. Aragon, founded in 809 by Aznar Galíndez, grew around Jaca and the high valleys of the Aragon River, protecting the old Roman road. By the end of the 10th century, Aragon was annexed by Navarre. Sobrarbe and Ribagorza were small counties and had little significance to the progress of the Reconquista. In the late 9th century under Count Wilfred, Barcelona became the de facto capital of the region. It controlled the other counties' policies in a union, which led in 948 to the independence of Barcelona under Count Borrel II, who declared that the new dynasty in France (the Capets) were not the legitimate rulers of France nor, as a result, of his county. These states were small and, with the exception of Navarre, did not have the capacity for attacking the Muslims in the way that Asturias did, but their mountainous geography rendered them relatively safe from being conquered, and their borders remained stable for two centuries. In the High Middle Ages, the fight against the Moors in the Iberian Peninsula became linked to the fight of the whole of Christendom. The Reconquista was originally a mere war of conquest. It only later underwent a significant shift in meaning toward a religiously justified war of liberation (see the Augustinian concept of a Just War). The papacy and the influential Abbey of Cluny in Burgundy not only justified the acts of war but actively encouraged Christian knights to seek armed confrontation with Moorish "infidels" instead of with each other. From the 11th century onwards indulgences were granted: In 1064 Pope Alexander II promised the participants of an expedition against Barbastro (Tagr al-Andalus, Aragon) a collective indulgence 30 years before Pope Urban II called the First Crusade. Papal interest in Christian-Muslim relations in the peninsula was not without precedent – Popes Leo IV (847–855), John VIII (872–882) and John XIX (1024–33) are all known to have displayed substantial interest in the region. Not until 1095 and the Council of Clermont did the Reconquista amalgamate the conflicting concepts of a peaceful pilgrimage and armed knight-errantry. But the papacy left no doubt about the heavenly reward for knights fighting for Christ (militia Christi): in a letter, Urban II tried to persuade the reconquistadores fighting at Tarragona to stay in the Peninsula rather than joining the armed pilgrimage to conquer Jerusalem, saying that their contribution for Christianity was equally important. The pope promised them the same indulgences that he had promised to those who chose to join the First Crusade. Later military orders such as the Order of Santiago, Montesa, Order of Calatrava, and the Knights Templar were founded or called to fight in Iberia. The Popes called the knights of Europe to join the effort to destroy the Muslim states of the peninsula. After the so-called Disaster of Alarcos, French, Navarrese, Castilian, Portuguese and Aragonese armies united against the Muslim forces in the massive battle of Las Navas de Tolosa (1212). The large territories awarded to military orders and nobles were the origin of the latifundia in today's Andalusia and Extremadura in Spain, and Alentejo in Portugal. In an atmosphere of constant conflict, warfare and daily life were strongly intertwined during this period. Small, lightly equipped armies reflected the need for society to be on constant alert. These forces were capable of moving long distances in short times, allowing a quick return home after sacking a target. Battles were mainly waged between clans, expelling intruder armies or sacking expeditions. In the context of the relative isolation of the Iberian Peninsula from the rest of Europe, and the contact with Moorish culture, geographical and cultural differences necessitated the use of military strategies, tactics, and equipment that were markedly different from those found in the rest of western Europe during this period. Medieval Iberian armies mainly comprised two types of forces: the cavalry (mostly nobles, but including commoner knights from the 10th century on) and the infantry, or peones (peasants). Infantry only went to war if needed, which was not frequent. Iberian cavalry tactics involved knights approaching the enemy, throwing javelins, then withdrawing to a safe distance before commencing another assault. Once the enemy formation was sufficiently weakened, the knights charged with thrusting spears (lances did not arrive in Hispania until the 11th century). There were three types of knights (caballeros): royal knights, noble knights (caballeros hidalgos), and commoner knights (caballeros villanos, or "mounted soldier from a villa"). Royal knights were mainly nobles with a close relationship with the king, and thus claimed a direct Gothic inheritance. Royal knights in the early stages of the Reconquista were equipped in the same manner as their Gothic predecessors: mail hauberk, kite shield, a long sword (designed to fight from the horse), javelins, spears and a Visigothic axe. Noble knights came from the ranks of the infanzones or lower nobles, whereas the commoner knights were not noble but were wealthy enough to afford a horse. Uniquely in Europe, these horsemen comprised a militia cavalry force with no feudal links, being under the sole control of the king or the count of Castile because of fueros (charters) with the crown. Both noble and common knights wore padded armour and carried javelins, spears and round-tasselled shields (influenced by Moorish shields), as well as a sword. The peones were peasants who went to battle in service of their feudal lord. Poorly equipped, with bows and arrows, spears and short swords, they were mainly used as auxiliary troops. Their function in battle was to contain the enemy troops until the cavalry arrived and to block the enemy infantry from charging the knights. The longbow, the composite bow, and the crossbow were the basic types of bows and were especially popular in the infantry. In the early Middle Age Iberian armour was typically made of leather, with iron scales. Head protections consisted of a round helmet with nose protector (influenced by the designs used by Vikings, who attacked during the 8th and 9th centuries) and a chain mail headpiece. Shields were often round or kidney-shaped, except for the kite-shaped designs used by the royal knights. Usually adorned with geometric designs, crosses or tassels, shields were made out of wood and had a leather cover. Steel swords were the most common weapon. The cavalry used long double-edged swords and the infantry short, single-edged ones. Guards were either semicircular or straight, but always highly ornamented with geometrical patterns. Spears and javelins were up to 1.5 metres long and had an iron tip. The double-axe – made of iron, 30 cm long, and possessing an extremely sharp edge – was designed to be equally useful as a thrown weapon or in close combat. Maces and hammers were not common, but some specimens have remained and are thought to have been used by members of the cavalry. Finally, mercenaries were an important factor, as many kings did not have enough soldiers available. Norsemen, Flemish spearmen, Frankish knights, Moorish mounted archers, and Berber light cavalry were the main types of mercenaries available and used in the conflict. This style of warfare remained dominant in the Iberian Peninsula until the late 11th century, when lance tactics entered from France, although the traditional horse javelin-shot techniques continued to be used. In the 12th and 13th centuries, soldiers typically carried a sword, a lance, a javelin, and either bow and arrows or crossbow and darts/bolts. Armor consisted of a coat of mail over a quilted jacket, extending at least to the knees, a helmet or iron cap, and bracers protecting the arms and thighs, either metal or leather. Shields were round or triangular, made of wood, covered with leather, and protected by an iron band; the shields of knights and nobles would bear the family's coat of arms. Knights rode in both the Muslim style, a la jineta (i.e. the equivalent of a modern jockey's seat), a short stirrup strap and bended knees allowed for better control and speed, or in the French style, a la brida, a long stirrup strap allowed for more security in the saddle (i.e. the equivalent of the modern cavalry seat, which is more secure) when acting as heavy cavalry. Horses were occasionally fitted with a coat of mail as well. Around the 14th and 15th centuries heavy cavalry gained a predominant role, where knights used to wear full plate armors. The northern principalities and kingdoms survived in their mountainous strongholds (see above). However, they started a definite territorial expansion south at the turn of the 10th century (Leon, Najera). The fall of the Caliphate of Cordova (1031) heralded a period of military expansion for the northern kingdoms, now divided into several mighty regional powers after the division of the Kingdom of Navarre (1035). A myriad of autonomous Christian kingdoms emerged thereafter. The Kingdom of Asturias was located in the Cantabrian Mountains, a wet and mountainous region in the north of the Iberian Peninsula. It was the first Christian power to emerge. The kingdom was established by a nobleman, Pelagius (Pelayo), who had possibly returned after the Battle of Guadalete in 711 and was elected leader of the Asturians, laying the foundations for the Kingdom of Asturias and starting the Astur-Leonese dynasty that spanned from 718 to 1037 and led the initial efforts in the Iberian peninsula to take back the territories then ruled by the Moors. Although the new dynasty first ruled in the mountains of Asturias, with the capital of the kingdom established initially in Cangas de Onís, and was in its dawn mostly concerned with securing the territory and settling the monarchy, the latest kings (particularly Alfonso III of Asturias) emphasized the nature of the new kingdom as heir of that in Toledo and the restoration of the Visigothic nation in order to vindicate the expansion to the south. However, such claims have been overall dismissed by modern historiography, emphasizing the distinct, autochthonous nature of the Cantabro-Asturian and Vasconic domains with no continuation to the Gothic Kingdom of Toledo. Pelagius' kingdom initially was little more than a gathering point for the existing guerrilla forces. During the first decades, the Asturian dominion over the different areas of the kingdom was still lax, and for this reason it had to be continually strengthened through matrimonial alliances with other powerful families from the north of the Iberian Peninsula. Thus, Ermesinda, Pelagius' daughter, was married to Alfonso, Dux Peter of Cantabria's son. Alfonso's son Fruela married Munia, a Basque from Álava, after crushing a Basque uprising (probably resistance). Their son is reported to be Alfonso II, while Alfonso I's daughter Adosinda married Silo, a local chief from the area of Flavionavia, Pravia. Alfonso's military strategy was typical of Iberian warfare at the time. Lacking the means needed for wholesale conquest of large territories, his tactics consisted of raids in the border regions of Vardulia. With the plunder he gained further military forces could be paid, enabling him to raid the Muslim cities of Lisbon, Zamora, and Coimbra. Alfonso I also expanded his realm westwards conquering Galicia. During the reign of King Alfonso II (791–842), the kingdom was firmly established, and a series of Muslim raids caused the transfer of the Asturian capital to Oviedo. The king is believed to have initiated diplomatic contacts with the kings of Pamplona and the Carolingians, thereby gaining official recognition for his kingdom and his crown from the Pope and Charlemagne. The bones of St. James the Great were proclaimed to have been found in Iria Flavia (present day Padrón) in 813 or probably two or three decades later. The cult of the saint was transferred later to Compostela (from Latin campus stellae, literally "the star field"), possibly in the early 10th century when the focus of Asturian power moved from the mountains over to León, to become the Kingdom of León or Galicia-León. Santiago's were among many saint relics proclaimed to have been found across north-western Iberia. Pilgrims started to flow in from other Iberian Christian realms, sowing the seeds of the later Way of Saint James (11–12th century) that sparked the enthusiasm and religious zeal of continental Christian Europe for centuries. Despite numerous battles, neither the Umayyads nor the Asturians had sufficient forces to secure control over these northern territories. Under the reign of Ramiro, famed for the highly legendary Battle of Clavijo, the border began to slowly move southward and Asturian holdings in Castile, Galicia, and León were fortified, and an intensive program of re-population of the countryside began in those territories. In 924 the Kingdom of Asturias became the Kingdom of León, when León became the seat of the royal court (it didn't bear any official name). Alfonso III of Asturias repopulated the strategically important city León and established it as his capital. King Alfonso began a series of campaigns to establish control over all the lands north of the Douro river. He reorganized his territories into the major duchies (Galicia and Portugal) and major counties (Saldaña and Castile), and fortified the borders with many castles. At his death in 910 the shift in regional power was completed as the kingdom became the Kingdom of León. From this power base, his heir Ordoño II was able to organize attacks against Toledo and even Seville. The Caliphate of Córdoba was gaining power, and began to attack León. King Ordoño allied with Navarre against Abd-al-Rahman, but they were defeated in Valdejunquera in 920. For the next 80 years, the Kingdom of León suffered civil wars, Moorish attack, internal intrigues and assassinations, and the partial independence of Galicia and Castile, thus delaying the reconquest and weakening the Christian forces. It was not until the following century that the Christians started to see their conquests as part of a long-term effort to restore the unity of the Visigothic kingdom. The only point during this period when the situation became hopeful for León was the reign of Ramiro II. King Ramiro, in alliance with Fernán González of Castile and his retinue of caballeros villanos, defeated the Caliph in Simancas in 939. After this battle, when the Caliph barely escaped with his guard and the rest of the army was destroyed, King Ramiro obtained 12 years of peace, but he had to give González the independence of Castile as payment for his help in the battle. After this defeat, Moorish attacks abated until Almanzor began his campaigns. Alfonso V finally regained control over his domains in 1002. Navarre, though attacked by Almanzor, remained intact. The conquest of León did not include Galicia which was left to temporary independence after the withdrawal of the Leonese king. Galicia was conquered soon after (by Ferdinand, son of Sancho the Great, around 1038). However, this brief period of independence meant that Galicia remained a kingdom and fief of Leon, which is the reason it is part of Spain and not Portugal. Subsequent kings titled themselves kings of Galicia and León, instead of merely king of León as the two were united personally and not in union. Ferdinand I of León was the leading king of the mid-11th century. He conquered Coimbra and attacked the taifa kingdoms, often demanding the tributes known as parias. Ferdinand's strategy was to continue to demand parias until the taifa was greatly weakened both militarily and financially. He also repopulated the Borders with numerous fueros. Following the Navarrese tradition, on his death in 1064 he divided his kingdom between his sons. His son Sancho II of Castile wanted to reunite the kingdom of his father and attacked his brothers, with a young noble at his side: Rodrigo Díaz, later known as El Cid Campeador. Sancho was killed in the siege of Zamora by the traitor Bellido Dolfos (also known as Vellido Adolfo) in 1072. His brother Alfonso VI took over León, Castile and Galicia. Alfonso VI the Brave gave more power to the fueros and repopulated Segovia, Ávila and Salamanca. Once he had secured the Borders, King Alfonso conquered the powerful Taifa kingdom of Toledo in 1085. Toledo, which was the former capital of the Visigoths, was a very important landmark, and the conquest made Alfonso renowned throughout the Christian world. However, this "conquest" was conducted rather gradually, and mostly peacefully, during the course of several decades. It was not until after sporadic and consistent population resettlements had taken place that Toledo was decisively conquered. Alfonso VI was first and foremost a tactful monarch who chose to understand the kings of taifa and employed unprecedented diplomatic measures to attain political feats before considering the use of force. He adopted the title Imperator totius Hispaniae ("Emperor of all Hispania", referring to all the Christian kingdoms of the Iberian Peninsula, and not just the modern country of Spain). Alfonso's more aggressive policy towards the taifas worried the rulers of those kingdoms, who called on the African Almoravids for help. The Kingdom of Pamplona primarily extended along either side of the Pyrenees on the Atlantic Ocean. The kingdom was formed when local leader Íñigo Arista led a revolt against the regional Frankish authority and was elected or declared King in Pamplona (traditionally in 824), establishing a kingdom inextricably linked at this stage to their kinsmen, the muwallad Banu Qasi of Tudela. Although relatively weak until the early 11th century, Pamplona took a more active role after the accession of Sancho the Great (1004–1035). The kingdom expanded greatly under his reign, as it absorbed Castile, Leon, and what was to be Aragon, in addition to other small counties that would unite and become the Principality of Catalonia. This expansion also led to the independence of Galicia, as well as gaining overlordship over Gascony. In the 12th century, however, the kingdom contracted to its core, and in 1162 King Sancho VI declared himself king of Navarre. Throughout its early history, the Navarrese kingdom engaged in frequent skirmishes with the Carolingian Empire, from which it maintained its independence, a key feature of its history until 1513. The Kingdom of Aragon started off as an offshoot of the Kingdom of Navarre. It was formed when Sancho III of Navarre decided to divide his large realm among all his sons. Aragon was the portion of the realm which passed to Ramiro I of Aragon, an illegitimate son of Sancho III. The kingdoms of Aragon and Navarre were several times united in personal union until the death of Alfonso the Battler in 1135. In 1137 the heiress of the kingdom married the count of Barcelona, and their son Alfonso II ruled from 1162 the combined possessions of his parents, resulting in what modern historians call the Crown of Aragon. In the following centuries, the Crown of Aragon conquered a number of territories in the Iberian peninsula and the Mediterranean, including the kingdom of Valencia and the kingdom of Mallorca. James I of Aragon, also known as James the Conqueror, expanded his territories to the north, south and east. James also signed the Treaty of Corbeil (1258), which released him from the nominal suzerainty of the King of France. Early in his reign, James attempted to reunite the Aragonese and Navarrese crowns through a treaty with the childless Sancho VII of Navarre. But the Navarrese nobles rejected him, and chose Theobald IV of Champagne in his stead. Later on, Ferdinand II of Aragon, married Isabella of Castile, leading to a dynastic union which eventually gave birth to modern Spain, after the conquest of Upper Navarre (Navarre south of the Pyrenees) and the kingdom of Granada. In 1139, after an overwhelming victory in the Battle of Ourique against the Almoravids, Afonso Henriques was proclaimed the first King of Portugal by his troops. According to the legend, Christ announced from heaven Afonso's great deeds, whereby he would establish the first Portuguese Cortes at Lamego and be crowned by the Primate Archbishop of Braga. In the Treaty of Zamora in 1143, Alfonso VII of León and Castile recognized Portuguese independence from the Kingdom of León. In 1147, Portugal captured Santarém, and seven months later the city of Lisbon was also brought under Portuguese control after the Siege of Lisbon. By the papal bull Manifestis Probatum, Pope Alexander III recognized Afonso Henriques as King of Portugal in 1179. With Portugal finally recognized as an independent kingdom by its neighbours, Afonso Henriques and his successors, aided by Crusaders and the military monastic orders the Knights Templar, the Order of Aviz or the Order of Saint James, pushed the Moors to the Algarve on the southern coast of Portugal. After several campaigns, the Portuguese part in the Reconquista came to an end with the definitive capture of the Algarve in 1249. With all of Portugal now under the control of Afonso III of Portugal, religious, cultural and ethnic groups became gradually homogenized. After the completion of the Reconquista, the Portuguese territory was a Roman Catholic realm. Nonetheless, Denis of Portugal carried out a short war with Castile for possession of the towns of Serpa and Moura. After this, Denis avoided war; he signed the Treaty of Alcanizes with Ferdinand IV of Castile in 1297, establishing the present-day borders. During the suppression of the Knights Templar all over Europe, under the influence of Philip IV of France and Pope Clement V requesting its annihilation by 1312, King Denis reinstituted the Templars of Tomar as the Order of Christ in 1319. Denis believed that the Order's assets should by their nature stay in any given Order instead of being taken by the King, largely for the Templars' contribution to the Reconquista and the reconstruction of Portugal after the wars. The experience gained during the battles of the Reconquista was fundamental to Conquest of Ceuta, the first step to the establishment of the Portuguese Empire. Likewise, the contact with Muslim's navigation techniques and sciences enabled the creation of Portuguese nautical innovations such as the caravel – the principal Portuguese ship during their voyages of exploration in the Age of Discovery. Minor Christian realms were the Kingdom of Viguera (970–1005), and the Principality of Valencia (1094–1102). Clashes and raids on bordering Andalusian lands did not keep the Christian kingdoms from battling among themselves or allying with Muslim kings. Some Muslim kings had Christian-born wives or mothers. Some Christian champions, like El Cid, were contracted by taifa kings to fight against their neighbours. Indeed, El Cid's first battle experience was gained fighting for a Muslim state against a Christian state. At the Battle of Graus in 1063, he and other Castilians fought on the side of al-Muqtadir, Muslim sultan of Zaragoza, against the forces of Ramiro I of Aragon. There is even an instance of a crusade being declared against another Christian king in Iberia. Following the disastrous defeat of Alfonso VIII, King of Castile, at Alarcos, Kings Alfonso IX of León and Sancho VII of Navarre entered an alliance with the Almohads and invaded Castile in 1196. By the end of the year Sancho VII had dropped out of the war under Papal pressure. Early in 1197, at the request of Sancho I, King of Portugal, Pope Celestine III declared a crusade against Alfonso IX and released his subjects from their responsibilities to the king, declaring that "the men of his realm shall be absolved from their fidelity and his dominion by authority of the apostolic see." Together the Kings of Portugal, Castile, and Aragon invaded León. In the face of this onslaught combined with pressure from the Pope, Alfonso IX was finally forced to sue for peace in October 1197. In the late years of Al-Andalus, Castile had the might to conquer the remnants of the kingdom of Granada, but the kings preferred to claim the tribute of the Muslim parias. The trade of Granadan goods and the parias were a major means by which African gold entered medieval Europe. The Reconquista was a process not only of war and conquest, but also of repopulation. Christian kings moved their own people to locations abandoned by Muslims in order to have a population capable of defending the borders. The main repopulation areas were the Douro Basin (the northern plateau), the high Ebro valley (La Rioja) and central Catalonia. The repopulation of the Douro Basin took place in two distinct phases. North of the river, between the 9th and 10th centuries, the "pressure" (or presura) system was employed. South of the Douro, in the 10th and 11th centuries, the presura led to the "charters" (forais or fueros). Fueros were used even south of the Central Range. The presura referred to a group of peasants who crossed the mountains and settled in the abandoned lands of the Douro Basin. Asturian laws promoted this system, for instance granting a peasant all the land he was able to work and defend as his own property. Of course, Asturian and Galician minor nobles and clergymen sent their own expeditions with the peasants they maintained. This led to very feudalised areas, such as León and Portugal, whereas Castile, an arid land with vast plains and harsh climate, only attracted peasants with no hope in Biscay. As a consequence, Castile was governed by a single count, but had a largely non-feudal territory with many free peasants. Presuras also appear in Catalonia, when the count of Barcelona ordered the Bishop of Urgell and the count of Gerona to repopulate the plains of Vic. During the 10th century and onwards, cities and towns gained more importance and power, as commerce reappeared and the population kept growing. Fueros were charters documenting the privileges and usages given to all the people repopulating a town. The fueros provided a means of escape from the feudal system, as fueros were only granted by the monarch. As a result, the town council was dependent on the monarch alone and, in turn, was required to provide auxilium – aid or troops – for their monarch. The military force of the towns became the caballeros villanos. The first fuero was given by count Fernán González to the inhabitants of Castrojeriz in the 940's. The most important towns of medieval Iberia had fueros, or forais. In Navarre, fueros were the main repopulating system. Later on, in the 12th century, Aragon also employed the system; for example, the fuero of Teruel, which was one of the last fueros, in the early 13th century. From the mid-13th century on, no more charters were granted, as the demographic pressure had disappeared and other means of re-population were created. Fueros remained as city charters until the 18th century in Aragon, Valencia and Catalonia and until the 19th century in Castile and Navarre. Fueros had an immense importance for those living under them, who were prepared to go to war to defend their rights under the charter. In the 19th century, the abolition of the fueros in Navarre would be one of the causes of the Carlist Wars. In Castile, disputes over the system contributed to the war against Charles I (Castilian War of the Communities). During the 9th century the Berbers returned to North Africa in the aftermath of revolts. Many governors of large cities distant from the capital, Córdoba, had planned to establish their independence. Then, in 929, the Emir of Córdoba (Abd-ar-Rahman III), the leader of the Umayyad dynasty, declared himself Caliph, independent from the Abbasids in Baghdad. He took all the military, religious, and political power and reorganised the army and the bureaucracy. After regaining control over the dissident governors, Abd-ar-Rahman III tried to conquer the remaining Christian kingdoms of the Iberian peninsula, attacking them several times and forcing them back beyond the Cantabrian Mountains. Abd-ar-Rahman's grandson later became a puppet in the hands of the great Vizier Almanzor (al-Mansur, "the victorious"). Almanzor waged several campaigns attacking and sacking Burgos, León, Pamplona, Barcelona, and Santiago de Compostela before his death in 1002. 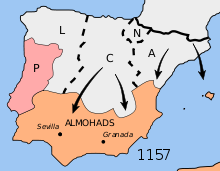 Between Almanzor's death and 1031, Al-Andalus suffered many civil wars, which ended in the division into the Taifa kingdoms. The taifas were small kingdoms, established by the city governors. The result was many (up to 34) small kingdoms, each centered upon its capital. Their governors had no larger-scale vision of the Moorish presence in the Iberian peninsula and had no qualms about attacking their neighbouring kingdoms whenever they could gain advantage by doing so. The split into the taifa states weakened the Islamic presence, and the Christian kingdoms further advanced as Alfonso VI of León and Castile conquered Toledo in 1085. Surrounded by enemies, taifa rulers sent a desperate appeal to the Berber chieftain Yusuf ibn Tashfin, leader of the Almoravids. Extent of the Reconquista into Almohad territory as of 1157. The Almoravids were a Muslim militia primarily composed of Berber and African Moors, and unlike previous Muslim rulers, they were not so tolerant towards Christians and Jews. Their armies entered the Iberian peninsula on several occasions (1086, 1088, 1093) and defeated King Alfonso at the Battle of Sagrajas in 1086, but initially their purpose was to unite all the taifas into a single Almoravid Caliphate. Their actions halted the southward expansion of the Christian kingdoms. Their only defeat came at Valencia in 1094, due to the actions of El Cid. Meanwhile, Navarre lost all importance under King Sancho IV, for he lost Rioja to Sancho II of Castile, and nearly became the vassal of Aragon. At his death, the Navarrese chose as their king Sancho Ramírez, King of Aragon, who thus became Sancho V of Navarre and I of Aragon. Sancho Ramírez gained international recognition for Aragon, uniting it with Navarre and expanding the borders south, conquering Wasqat Huesca deep in the valleys in 1096 and building a fort, El Castellar, 25 km from Saraqustat Zaragoza. Catalonia came under intense pressure from the taifas of Zaragoza and Lérida, as well as from internal disputes, as Barcelona suffered a dynastic crisis that led to open war among the smaller counties. But by the 1080s, the situation had calmed down, and the dominion of Barcelona over the smaller counties was restored. After a brief period of disintegration (the second Taifa period), the Almohads, the rising power in North Africa, took over most of Al-Andalus. However they were decisively defeated at the Battle of Las Navas de Tolosa (1212) by a Christian coalition, losing almost all the remaining lands of Al-Andalus in the following decades. By 1252 only the Kingdom of Granada remained intact but as a vassal state of Castile. Ferdinand and Isabella completed the Reconquista with a war against the Emirate of Granada that started in 1482 and ended with Granada's surrender on January 2, 1492. The Moors in Castile previously numbered "half a million within the realm". By 1492 some 100,000 had died or been enslaved, 200,000 had emigrated, and 200,000 remained in Castile. Many of the Muslim elite, including Granada's former Emir Muhammad XII, who had been given the area of the Alpujarras mountains as a principality, found life under Christian rule intolerable and emigrated to Tlemcen in North Africa. In 1497 Spanish forces took Melilla, west of Oran, and the island of Djerba, south of Tunis, and went on to more important gains, with the bloody seizure of Oran in 1509, and the capture of Bougie and Tripoli in 1510. The Spanish capture of Tripoli cost them some 300 men, while the inhabitants suffered between 3,000 and 5,000 killed and another 5,000–6,000 carried off as slaves. Soon thereafter, however, they faced competition from the rapidly expanding Ottoman Empire in the east and were pushed back. As elsewhere in the Muslim world, Christians and Jews were allowed to retain their religions, with their own legal systems and courts, by paying a tax, the jizya. The penalty for not paying it was imprisonment and death. The new Christian hierarchy demanded heavy taxes from non-Christians and gave them rights, such as in the Treaty of Granada (1491) only for Moors in recently Islamic Granada. On July 30, 1492, all the Jewish community – some 200,000 people – were forcibly expelled. The next year the Alhambra decree ordered the expulsion of practicing Jews, leading many to convert to Catholicism. In 1502, Queen Isabella I declared conversion to Catholicism compulsory within the Kingdom of Castile. King Charles V did the same to Moors in the Kingdom of Aragon in 1526, forcing conversions of its Muslim population during the Revolt of the Germanies. Many local officials took advantage of the situation to seize property. 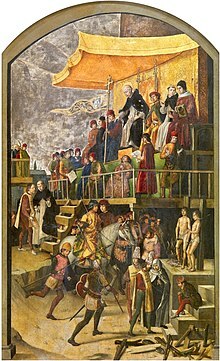 Most of the descendants of those Muslims who submitted to conversion to Christianity – rather than exile – during the early periods of the Spanish and Portuguese Inquisition, the Moriscos, were later expelled from Spain after serious social upheaval, when the Inquisition was at its height. The expulsions were carried out more severely in eastern Spain (Valencia and Aragon) due to local animosity towards Muslims and Moriscos where they were seen as economic rivals by local workers who saw them as cheap labor undermining their bargaining position with the landlords. Exactions imposed on the Moriscos paved the way to a major Morisco revolt happening in 1568, with the final expulsion of the Moriscos from Castile taking place in 1609; they were driven from Aragon at about the same time. Making things more complex were the many former Muslims and Jews known as Moriscos, Marranos, and Conversos, who shared ancestors in common with many Christians, especially among the aristocracy, causing much concern over loyalty and attempts by the aristocracy to hide their non-Christian ancestry. Some – the numbers are debated – continued to secretly practice their religions and use their languages well into the sixteenth century. Those that the Spanish Inquisition found to be secretly practicing Islam or Judaism were executed, imprisoned, or exiled. Nevertheless, all those deemed to be "New Christians" were repeatedly suspected of illegally continuing in secret to practice their religions various crimes against the Spanish state including continued practice of Islam or Judaism. New Christians were subject to many discriminatory practices starting in the sixteenth century. The Muladi: Christians under Islamic rule who converted to Islam after the arrival of the Berbers. The Mozarabs: Christians in Muslim-held lands. Some of them migrated to the north of the peninsula in times of persecution bringing elements of the styles, food and agricultural practices learned from the Andalusians, while they continued practicing their Christianity with older forms of Catholic worship and their own versions of the Latin language. "New Christians", Jews converting to Christianity called conversos, or pejoratively Marranos. Jews converted to Christianity voluntarily or through force. Some were Crypto-Jews who continued practicing Judaism secretly. All remaining Jews were expelled from Spain as a consequence of the 1492 Alhambra Decree, and from Portugal in 1497. Former Jews, known as Conversos (the converted), were subject to the Spanish and Portuguese Inquisitions, established to enforce Christian faith and practice, which often resulted in secret investigations and public punishments of conversos in auto-da-fés ("acts of faith"), often public executions by burning the victim alive. The Mudéjar : Muslims in Christian-held lands. Moriscos: Muslim conversos. Muslims who were forced to convert to Catholicism. A significant number were Crypto-Muslims who continued practicing Islam secretly. They ranged from successful skilled artisans, valued and protected in Aragon, to impoverished peasants in Castile. After the Alhambra Decree the entire Islamic population was forced to convert or leave, and at the beginning of the seventeenth century a significant number were expelled in the Expulsion of the Moriscos. Real, legendary, and fictional episodes from the Reconquista are the subject of much of medieval Galician-Portuguese, Spanish, and Catalan literature such as the cantar de gesta. Some noble genealogies show the close relations (although not very numerous) between Muslims and Christians. For example, Al-Mansur Ibn Abi Aamir, whose rule is considered to have marked the peak of power for Moorish Al-Andalus Iberia, married Abda, daughter of Sancho Garcés II of Navarra, who bore him a son, named Abd al-Rahman and commonly known in pejorative sense as Sanchuelo (Little Sancho; in Arabic: Shanjoul). After his father's death, Sanchuelo/Abd al-Rahman, as a son of a Christian princess, was a strong contender to take over the ultimate power in Muslim al-Andalus. A hundred years later, King Alfonso VI of Castile, considered among the greatest of the Medieval Spanish kings, designated as his heir his son (also a Sancho) by the refugee Muslim princess Zaida of Seville. The Reconquista was a war with long periods of respite between the adversaries, partly for pragmatic reasons and also due to infighting among the Christian kingdoms of the North spanning over seven centuries. Some populations practiced Islam or Christianity as their own religion during these centuries, so the identity of contenders changed over time. Currently, festivals called moros y cristianos (Castilian), moros i cristians (Catalan), mouros e cristãos (Portuguese) and mouros e cristiáns (Galician), which all mean "Moors and Christians", recreate the fights as colorful parades with elaborate garments and lots of fireworks, especially on the central and southern towns of the Land of Valencia, like Alcoi, Ontinyent or Villena. A 2016 study found that the "rate of Reconquest"—how rapidly the Christian frontier was expanded—has persistent effects on the Spanish economy to this day. After an initial phase of military conquest, Christians states incorporated the conquered land. When large frontier regions were incorporated at once, the land was mostly given to the nobility and the military orders, with negative effects on long-term development. The incorporation of small regions, on the other hand, generally allowed for the participation of individual settlers and was more likely to fall under the auspices of the crown. This led to a more equitable distribution of land and greater social equality, with positive effects on long-term development. On the conclusion of Iberian victory over the Moors, the Iberian powers, Spain and Portugal didn't stop their warring against the Muslims solely in their homelands—they extended the conflict against Islam overseas. The Spanish under the Hapsburg dynasty soon became the champions of Roman Catholicism in Europe and the Mediterranean against the encroaching threat of the Ottoman Caliphate. In a similar vein, the Portuguese also extended the Reconquista, this time against Muslim states overseas. The conquest of Ceuta marked the beginning of Portuguese expansion into Muslim Africa. Soon, the Portuguese also went into conflict with the Ottoman Caliphate in the Mediterranean, Indian Ocean and Southeast Asia as the Portuguese conquered the Ottomans' allies: the Sultanate of Adal in East Africa, the Sultanate of Delhi in South Asia and the Sultanate of Malacca in Southeast Asia. Meanwhile, the Spanish also went to war against the Sultanate of Brunei in Southeast Asia. The Spanish sent expeditions from New Spain (Mexico) to conquer and Christianize the Philippines, then a territory of the Sultanate of Brunei. Brunei itself was assaulted during the Castilian War. Spain also went to war against the Sultanates of Sulu, Maguindanao, and Lanao in the Spanish-Moro Conflict. The primary inspiration for these wars against Muslim states overseas was the Reconquista. 711: The invasion of Christian Visigothic-ruled Iberia by Islamic Arab-Berber armies of the Umayyad Caliphate begins. 717: First Umayyad foray over the Pyrenees into Visigothic Gaul. 719: Islamic Umayyad rule in Iberia at its widest, covering almost all of the Iberian Peninsula and across the Pyrenees in Narbonne. 718 or 722: Battle of Covadonga in the north-west of Iberia, establishing a Christian Kingdom in Asturias. 739: Berber garrison driven from the Kingdom of Galicia. 742: Berber garrisons give up their positions north of the Duero River to join the Berber rebellion. 759: Pepin the Short conquers the last Muslim strongholds in present-day France. 801: The Carolingians led by Louis the Pious conquer Barcelona, sack Lleida, and establish the Spanish March. 868: Conquest of the city of Porto, leading to the establishment of the County of Portucale (later Portugal). 871: Capture of Coimbra by the Asturians; County of Coimbra established. 914: Muslims briefly retake Barcelona. 929: Abd al-Rahman III declares caliphate in Córdoba, taking the title of "commander of the faithful" (caliph). 1085: Landmark conquest of Toledo by Castilian forces. Over half of Iberia conquered by Christian-ruled kingdoms. 1086: Almoravid defeated Castilian army and halted its advance at Battle of Sagrajas. 1097: First Crusade; two-thirds of the Iberian peninsula conquered by Christian-ruled kingdoms. 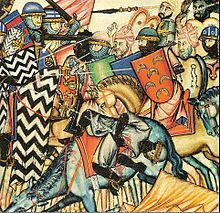 1118: Navarro-Aragonese troops capture the Muslim strongholds of Tudela and Zaragoza. 1147: Siege of Lisbon, where Second Crusade and the Kingdom of Portugal defeat the Almoravids. 1195: The Battle of Alarcos establishes Almohad authority in the south of the Iberia. 1212: The key battle of Navas de Tolosa heralds the steady political decline of the Iberian Muslim kingdoms. 1236: Cádiz and the former capital of the caliphate Córdoba are conquered by Castilian forces. 1248: Christian armies under Ferdinand III of Castile take Seville after 16 months of siege. 1249: King Afonso III of Portugal takes Faro (in the Algarve), ending the Portuguese Reconquista in 1249. 1249: The Emirate of Granada is now the only Islamic state in Iberia. 14th and 15th centuries: Marinid Muslims seize control of some towns on the southern coast but are soon driven out, leaving only a few isolated towns in the south of Granada still controlled by the Moors. 1492: Following the Treaty of Granada (November 25, 1491), the Moors surrender the city, completing the military phase of the Reconquista. 1492 and 1502: royal decrees order Muslims and Jews to convert to Catholicism or leave Castile. 1609 April 9, King Philip III of Spain decrees expulsion of the Moriscos (converted Muslims and their descendants). Catalan: [rəkuŋˈkestə ~ rekoŋˈkesta], spelled Reconquesta. Colloquially also known and spelled as Reconquista (pron. [rəkuŋˈkistə ~ rekoŋˈkista]). Arabic: سقوط الأندلس‎ suqūṭ al-ʾAndalus, "Fall of Al-Andalus"
^ Findlay, Ronald; Lundahl, Mats (2016). The Economics of the Frontier: Conquest and Settlement. Springer. p. 45. ^ Dadson, Trevor J. (2014). "Tolerance and Coexistence in Early Modern Spain: Old Christians and Moriscos in the Campo de Calatrava". Boydell & Brewer Ltd – via Google Books. ^ Boase, Roger (April 4, 2002). "The Muslim Expulsion from Spain". History Today. 52 (4). The majority of those permanently expelled settling in the Maghreb or Barbary Coast, especially in Oran, Tunis, Tlemcen, Tetuán, Rabat and Salé. Many travelled overland to France, but after the assassination of Henry of Navarre by Ravaillac in May 1610, they were forced to emigrate to Italy, Sicily or Constantinople. ^ O'Callaghan, Joseph F. (2003). Reconquest and Crusade in Medieval Spain. Philadelphia: University of Pennsylvania Press. p. 19. ISBN 978-0812236965. Retrieved February 15, 2012. ^ a b McKitterick, Rosamond; Collins, R. (1990). The New Cambridge Medieval. History 1. Cambridge University Press. p. 289. ISBN 9780521362924. Retrieved July 26, 2012. ^ María Rosa Menocal, The Ornament of the World: How Muslims, Jews and Christians Created a Culture of Tolerance in Medieval Spain, Back Bay Books, 2003, ISBN 0316168718, and see Golden age of Jewish culture in Spain. ^ O'Callaghan, Joseph F. (2013). Reconquest and Crusade in Medieval Spain. University of Pennsylvania Press. p. 18. ISBN 978-0-8122-0306-6. Retrieved October 23, 2017. ^ Kinoshita, Sharon (Winter 2001). "'Pagans are wrong and Christians are right': Alterity, Gender, and Nation in the Chanson de Roland". Journal of Medieval and Early Modern Studies. 31 (1): 79–111. ^ DiVanna, Isabel N. (2010). "Politicizing national literature: the scholarly debate around La Chanson de Roland in the nineteenth century". Historical Research. 84 (223): 109–134. doi:10.1111/j.1468-2281.2009.00540.x. ^ a b Alejandro García Sanjuán. "Vox, la Reconquista y la salvación de España". eldiario.es (in Spanish). Retrieved February 15, 2019. ^ "¿Por qué Vox rescata ahora el viejo concepto de 'Reconquista'?". www.publico.es. Retrieved February 15, 2019. ^ Press, Europa (January 11, 2019). "Casado, tras apelar Vox a la Reconquista: El PP ha empezado la reconquista por Andalucía y la acabará en Asturias". www.europapress.es. Retrieved February 15, 2019. ^ Bravo, Francisca. "Vox designa a Toledo como el punto donde comenzar la 'reconquista' del centro de España". eldiario.es (in Spanish). Retrieved February 15, 2019. ^ "Casado promete una 'reconquista' para que 'caiga el engaño independentista'". ElNacional.cat. Retrieved February 15, 2019. ^ Purkis, William J. (2010). Eleventh- and Twelfth-Century Perspectives on State Building in the Iberian Peninsula (PDF). University of Birmingham. pp. 57–58. Retrieved October 15, 2017. ^ Martín M. Ríos Saloma, "La Reconquista. Génesis de un mito historiográfico", Historia y Grafía, 30, 2008, pp. 191–216, redalyc.org, Retrieved October 12, 2014. ^ "Yo no entiendo cómo se puede llamar reconquista a una cosa que dura ocho siglos" ("I don't understand how something that lasted eight centuries can be called a reconquest"), in España invertebrada. Quoted by De Pagès, E. July 11, 2014. ^ Collins, Roger (1989). The Arab Conquest of Spain 710–797. Oxford, UK / Cambridge, US: Blackwell. pp. 38–45. ISBN 978-0-631-19405-7. ^ Fletcher, Richard (2006). Moorish Spain. Los Angeles: University of California Press. p. 43. ISBN 978-0-520-24840-3. ^ Chris Lowney, A Vanished World: Muslims, Christians, and Jews in Medieval Spain, (Oxford University Press, 2005), 40. ^ Roger Collins, Early Medieval Spain, (St.Martin's Press, 1995), 164. ^ Collins, Roger (1989). The Arab Conquest of Spain 710–797. Oxford, UK / Cambridge, US: Blackwell. p. 45. ISBN 978-0-631-19405-7. ^ Collins, Roger (1989). The Arab Conquest of Spain 710–797. Oxford, UK / Cambridge, US: Blackwell. p. 181. ISBN 978-0-631-19405-7. ^ Collins, Roger (1989). The Arab Conquest of Spain 710–797. Oxford, UK / Cambridge, US: Blackwell. p. 156. ISBN 978-0-631-19405-7. ^ Collins, Roger (1989). The Arab Conquest of Spain 710–797. Oxford, UK / Cambridge, US: Blackwell. pp. 156, 159. ISBN 978-0-631-19405-7. ^ Collins, Roger (1989). The Arab Conquest of Spain 710–797. Oxford, UK / Cambridge, US: Blackwell. p. 212. ISBN 978-0-631-19405-7. ^ a b c d Lewis, Archibald R. (1965). The Development of Southern French and Catalan Society, 718–1050. The University of Texas Press. pp. 20–33. Retrieved October 28, 2017. ^ Collins, Roger (1989). The Arab Conquest of Spain 710–797. Oxford, UK / Cambridge, US: Blackwell. pp. 118–126. ISBN 978-0-631-19405-7. ^ a b Collins, Roger (1989). The Arab Conquest of Spain 710–797. Oxford, UK / Cambridge, US: Blackwell. pp. 177–181. ISBN 978-0-631-19405-7. ^ Lewis, Archibald R. (1965). The Development of Southern French and Catalan Society, 718–1050. The University of Texas Press. pp. 37–49. Retrieved October 28, 2017. It took place on 28 December 801. ^ Hobson, John M. (2004). The Eastern Origins of Western Civilisation. Cambridge University Press. p. 141. ISBN 9780521547246. ^ a b Joseph O'Callaghan (2003). Reconquest and Crusade in Medieval Spain, Philadelphia: University of Philadelphia Press. p. 62. ^ The Last Great Muslim Empires. p. 138. ^ "Modern Jewish History: The Spanish Expulsion (1492)", The Jewish Virtual Library. ^ Censorship and Book Production in Spain During the Age of the Incunabula, Ignacio Tofiño-Quesada. Graduate Center, CUNY. ^ Childers, William (2004). ""'Según es cristiana la gente': The Quintanar of Persiles y Sigismunda and the Archival Record"" (PDF). Cervantes, Bulletin of the Cervantes Society of America. 24 (2). pp. 5–41. ^ Oto-Peralías, Daniel; Romero-Ávila, Diego (May 13, 2016). "The economic consequences of the Spanish Reconquest: the long-term effects of Medieval conquest and colonization" (PDF). Journal of Economic Growth. 21 (4): 409–464. doi:10.1007/s10887-016-9132-9. hdl:10023/10769. ISSN 1381-4338. ^ proficiscitur Hydruntum classis quam ex Portugallia accersivimus. . . Speramus illam magno usui Hydruntine expugnationi futuram. . .
^ "Letter from Francisco de Sande to Felipe II, 1578". Archived from the original on October 14, 2014. Retrieved October 17, 2009. ^ Collins, Roger (1990). The Basques (2nd ed.). Oxford, UK: Basil Blackwell. p. 104. ISBN 978-0631175650. ^ Setton, Kenneth Meyer, A History of the Crusades: The Fourteenth and Fifteenth Centuries, (University of Wisconsin Press, 1976), 432. ^ Hans-Jürgen Prien (November 21, 2012). Christianity in Latin America: Revised and Expanded Edition. BRILL. p. 11. ISBN 978-90-04-22262-5. ^ "The Edict of Expulsion of the Jews – 1492 Spain". Fletcher, R. A. "Reconquest and Crusade in Spain c. 1050–1150", Transactions of the Royal Historical Society 37, 1987. pp. García Fitz, Francisco, Guerra y relaciones políticas. Castilla-León y los musulmanes, ss. XI–XIII, Universidad de Sevilla, 2002. Reuter, Timothy; Allmand, Christopher; Luscombe, David; McKitterick, Rosamond (eds. ), The New Cambridge Medieval History, Cambridge University Press, 1995, ISBN 0-521-36291-1. Villegas-Aristizábal, Lucas, 2009, "Anglo-Norman Involvement in the Conquest and Settlement of Tortosa, 1148–1180", Crusades 8, pp. 63–129. Wikimedia Commons has media related to Reconquista.